Yachts Miami Beach will introduce a new look and layout when the show returns Feb. 16-20. Yachts Miami Beach spans more than a mile along Collins Avenue from 41st Street to 54th Street. Yachts Miami Beach will introduce a new look and layout when the show returns Feb. 16-20 next year on Collins Avenue, across from the legendary Fontainebleau and Eden Roc hotels. Organizers said the changes are designed to deliver superior guest and exhibitor experiences at the 29th annual edition of the city&apos;s premier in-water luxury yacht show. 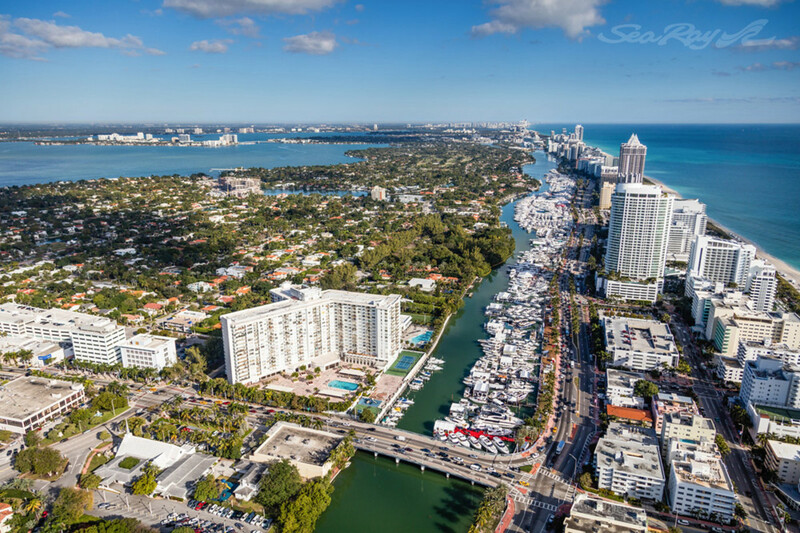 Show Management and the International Yacht Brokers Association, which co-own the show, engaged EDSA, one of the world&apos;s foremost design companies, to reimagine Yachts Miami Beach. EDSA is renowned for creating inspiring environments for distinctive destinations ranging from Atlantis in the Bahamas to the John F. Kennedy Center and Disney&apos;s signature resorts. "EDSA has translated our vision for engagement between exhibitors and buyers into a new, strategic and aesthetically pleasing design for Yachts Miami Beach," Dane Graziano, senior vice president and COO for Show Management, which manages and produces the show, said in a statement. "We have expanded show marketing this year to share our excitement about this great new experience planned for Miami Beach boat show weekend in February." Spanning more than a mile along Collins Avenue from 41st Street to 54th Street, the show&apos;s new layout highlights its picturesque, waterfront location along Indian Creek Waterway. Attendees enter through five artfully designed show entrances, each with attractive way-finding graphics and an information booth. Entry to the show is $20 per person per day. For the first time ever, guests can arrive at the show aboard water taxis connected to new, convenient parking locations. Foot traffic has been redirected from the sidewalk along Collins Avenue to the show&apos;s network of new floating docks, where guests will find food and beverage concessions in a welcoming environment where they can spend time and enjoy the show. A VIP Experience ticket has been added for Feb. 16-18 (Thursday, Friday and Saturday), which includes admission to the show and access to a new floating, air-conditioned VIP lounge that will feature a premium open bar, gourmet food, access to nightly events, private bathrooms, a water taxi pass and a dedicated concierge to arrange appointments on board yachts directly with exhibitors. For VIP tickets, please visit VIP.YachtsMiamiBeach.com. All of the new features are designed to create an interactive and inviting sales environment for exhibitors and buyers. Yachts are now arranged in dedicated new and brokerage sections, making it easier than ever before to find specific boats. From the north, water taxi service embarks from the Miami Beach Rowing Club on 65th Street. Convenient parking is available at the 67th Street parking garage. From the south, guests can park at the 17th Street Miami Beach Convention Center Parking Garage and hop a quick shuttle to the water taxi at 24th Street and Collins Avenue at the Traymore Hotel dock. Bus shuttle service also runs all day between Yachts Miami Beach and the Miami International Boat Show on Virginia Key. Valet parking is available at 43rd Street and Collins Avenue, closer to the valet garage than it was in the past, and taxis and Uber service are located at 46th Street and Collins Avenue. For the second year, Yachts Miami Beach will feature a display of superyachts at Island Gardens Deep Harbour on Watson Island located on I-395/MacArthur Causeway. The invitation-only "show within a show," known as Super Yacht Miami, will feature some of the boat show&apos;s largest yachts. Interested guests can make appointments for yacht tours by contacting exhibitors with displays at the venue or Show Management. More than 20 superyachts will be on display at this location, which can accommodate yachts as large as 500 feet. Two different boat shows take place in Miami and Miami Beach during Presidents&apos; Day weekend in February. Show Management produces Yachts Miami Beach and co-owns it with the IYBA. It is completely separate from the Miami International Boat Show on Virginia Key.